← Will the turkey habitat bill actually accomplish anything? State officials warn that without stocking cuts, fewer or smaller Chinook salmon may be the result in Lake Michigan and its tributaries like the Manistee River where this was caught. LANSING – Michigan fish managers are facing a frightening scenario on Lake Michigan: too few prey fish to sustain the salmon population at current stocking levels. The solutions, they say, involve cutting hatchery plants. Michigan’s Department of Natural Resources and Lake Michigan managers have invited anglers to have a say in the outcome. Four management options were presented to anglers in a workshop held April 14 in Benton Harbor. The choices were the consensus of a multi-state working group that spent a year reviewing Lake Michigan’s forage base and running stocking scenarios on a sophisticated computer model. Whittled down from a field of 25 choices, all four call for cutting stocking efforts by 30 to 50 percent and further decisions about lake trout, steelhead, brown trout and Coho salmon. Officials say they wanted options that would not decimate the forage base or result in smaller or fewer fish. Lake Michigan is stocked with 2.5 million Chinook salmon fingerlings annually. 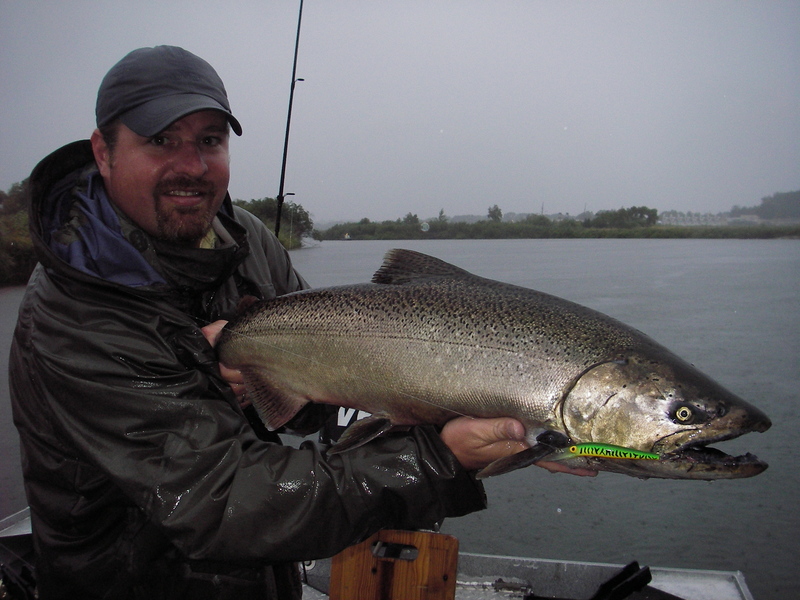 They feed exclusively on alewives unlike steelhead, coho salmon and brown trout which feed on various prey. If the alewives disappear so do the big kings. “We started the process a year ago. It does come with some anxiety,” said Denny Grinold, a Lake Michigan fishing charter captain at Grand Haven who represented the Michigan Charter Boat Association on the multi-state work group. Grinold also chairs the committee of advisors for the Great Lakes Fishery Commission. Lake Michigan forage is at an all time low, according to state and federal fish managers who conducted surveys on the lake. It is home to a robust 2010 alewife year-class and five other age-classes that contribute little to the forage base. No new forage showed up in 2011. State officials are hoping to see a new year-class develop in 2012. An acoustic survey of Lake Michigan prey fish in 2011 found approximately 25 kilotons, according to state officials. That’s 76 percent less than 2010, and an 84 percent less than the long-term average over 20 years. Lake Michigan fish managers prefer to see 100 kilotons or better. “The biomass in Lake Michigan is at record lows right now despite the strong 2010 year class that resulted in bigger fish last year.” said Jay Wesley the Lake Michigan basin coordinator for the Michigan Department of Natural Resources. “We are being very cautious about how we proceed. The 2010 year class is getting eaten up very quickly,” he said. “Throughout the 1970s to 90’s we always had nine year classes of alewives. We had young fish and very old fish. Now, we’re down to six age classes and 95 percent are from 2010. “We are getting to the point that we are loosing the older, bigger spawning fish. Lake Huron was down to four age classes when it crashed,” Wesley said. Lake Michigan is at a tipping point. Too little food in the lake means smaller and fewer fish caught, or worse. Quagga mussels are filtering out the tiny nutrients that young, larval prey fish need to thrive. The percentage of naturally reproduced Chinook salmon has grown steadily and now tops 50 percent and can run much higher. Those naturally reproducing fish put additional pressure on the forage. Canada also stocks Chinook salmon in Lake Huron which may have an impact on Lake Michigan. Chinook salmon travel hundreds of miles. Some worry they are migrating into Lake Michigan to feed. “What we are hearing from stakeholders is that they do not want the alewife population to collapse,” Wesley said. “We took the most severe stocking cuts off the table and then found a 20 percent Chinook cut scenario doesn’t do much because of the natural reproduction. Computer simulations of current stocking practices show a 23 percent chance of a low alewife population for Lake Michigan; a 35 percent chance of reduced weight in mature Chinook salmon; and a 20 percent chance of catch rates that are less than 8 fish per 100 hours. Experts say those figures suggest a relatively high risk of fishery collapse. “We can’t deny the lake is going through a dramatic ecological change,” Eade said. “At the same time we see the composition of the food web is changing dramatically and that natural recruitment is well over 50 percent. This is the message Michigan fish managers want anglers to consider. The working group examined the outcomes of various stocking and forage scenarios. Most agreed that any with more than a 20 percent risk of collapse was unacceptable. Most preferred lower-risk scenarios – which translates to greater stocking cuts. “I would rather not cut other species,” Robertson said, “in the interest of keeping diversity in the lake. If the primary problem is Chinook then cut Chinook and maintain the others. “In the 80s when Bacterial Kidney Disease showed up on Lake Michigan, what saved was that the steelhead was good, the Coho came on and there were lake trout. Those fish all filled the gap. Cut Chinook stocking by 30 percent and other species by 10 percent, except for lake trout which would be left alone. Monitor the species and adjust stocking based on that data. Cut Chinook stocking by 30 percent and other species including lake trout by 10 percent, again monitoring and adjusting along the way. Chinook-only cuts would go into effect in 2013. Those involving other species would go into effect in 2014. This entry was posted in Uncategorized and tagged Chinook, Chinook Salmon, DNR, Fishing, Great Lakes Fishery Commission, Michigan Department of Natural Resources, Salmon. Bookmark the permalink. Why not have an open season on cormorants? I’ve seen them in groups as ;ong as a half a mile long.